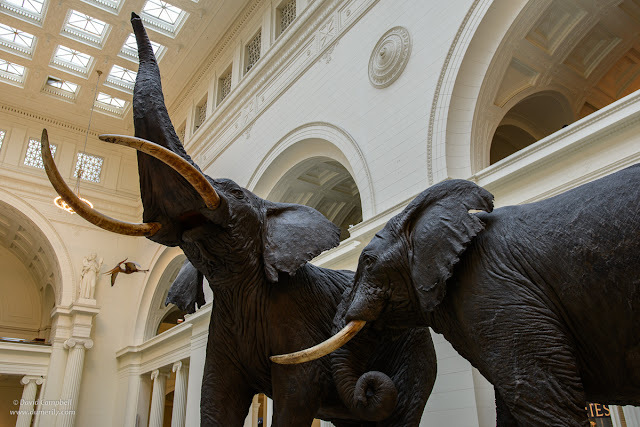 Here's my contribution to the plethora of photos of Carl Akeley's most famous work, Fighting African Elephants, at the Field Museum in Chicago. If you do a Google Search, you'll find hundreds, maybe thousands, of photos of these two cuddly stuffed animals. From a technical standpoint, the only tricky thing is dealing with the wide dynamic range from the almost-black elephants to the skylights. I think the more interesting challenge is capturing the sense of motion that Akeley conjured in this taxidermy mount, while working around the throng of museum visitors milling around the hall. I chose to get in fairly close and shoot upwards towards the pachyderms to crop the other museum visitors out of my shot. This had the added advantage of emphasizing their size.